Hello dear reader, this time I want to tell you how it is to sit for a coffee in of the spots the city of Perugia has to offer. If you end up in this Etruscan city of Perugia during the end of winter/beggining of spring you are really going to appreciate this coffe house which also provides quick snacks and munchies. After all the steps you have to do when you walk from one point to another of this city you will for sure feel like making a stop, get yourself together, catch your breath and why not indulge yourself with a nice cup of stirring hot cappuccio (italian for cappuccino). 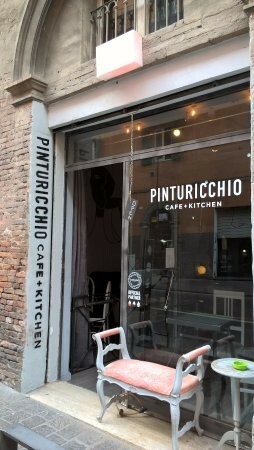 So yes let me give you my take on the place to be at when visiting Perugia, I am talking about the one and only Pinturicchio Cafe+Kitchen. This is a picture of the entrance to Pinturicchio cafe+kitchen which can be accessed simply from the main road, called Via Pinturicchio. In this very peculiar spot you can find a nicely furnished sitting area which can be ideal for something I like to call 'cafe co-working' where a group of collegues decide to show up with their work (in many corners I actually witnessed people taking laptops and so on, spending at times a prolonged hour in a given cafe). 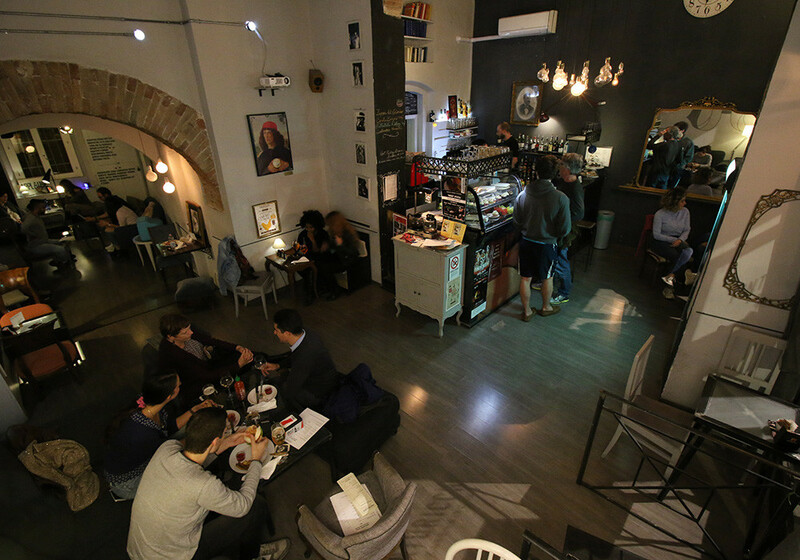 Pinturicchio cafe+kitchen is a great option as it doesn't get too crowded during day time. In addition to this spot always has a chill background music which I must say that it really sets up a nice atmosphere. The low-light areas provide a corner of tranquility and peace while other areas of the sitting area are well illuminated by means of low hanging light bulbs, perfect to create the coffee house ambience. 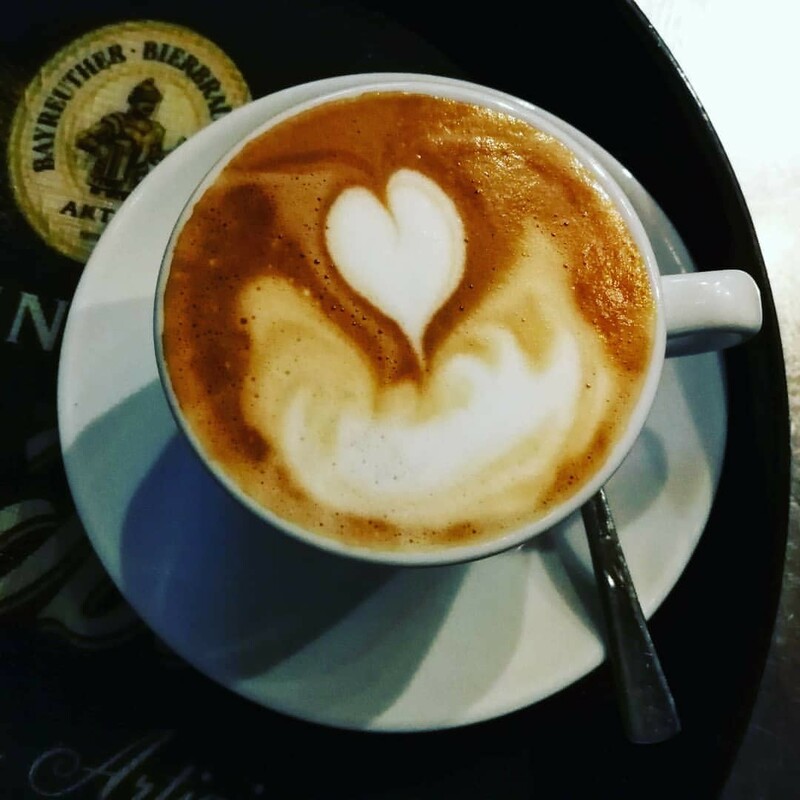 great varieties of hot drinks from your typical espresso, latte macchiato, to large cups of cappucino. A friend of mine told me that once he ordered a simple, hot cup of cappuccino and separetly got himself a shot of whisky. Guess what he did... after sipping some the cappuccino he put the whole shot of whisky in the cappuccino cup and then drank it all together. he seemed very happy about it so maybe you can try it out, who knows you might like it too. Note that among young people it is a typical practice to have an aperitivo which usually is some sort of a long dring , often lightly alcoholic, enjoyed while chit chatting between friends or while making new friends. 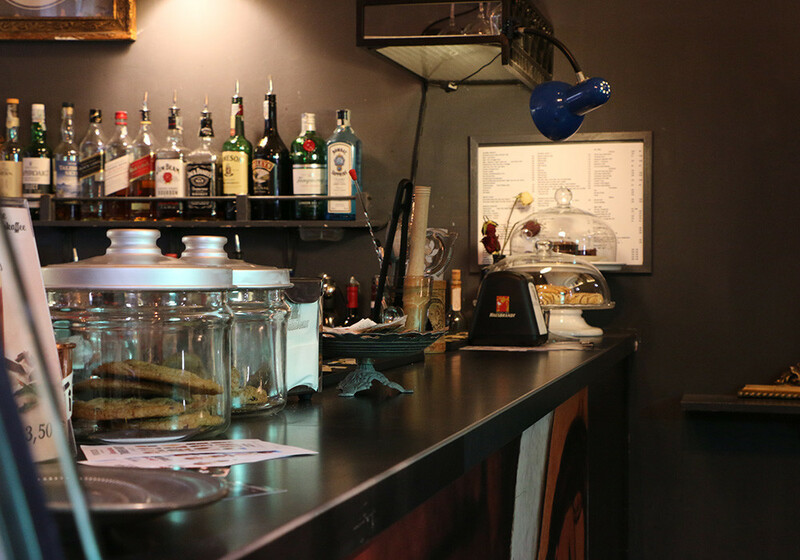 Pinturicchio cafe+kitchen provides a good assortments of beverages to satisfy its clients. 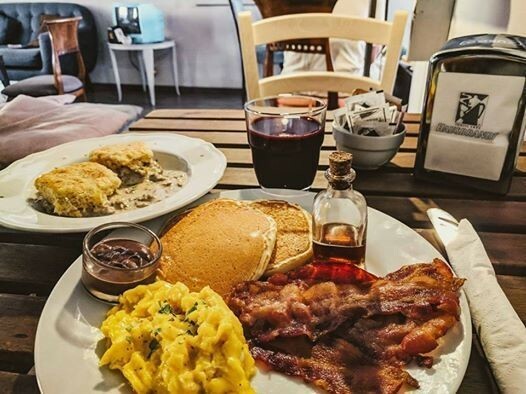 this place is not like your ordinary coffee house because it also has a kitchen so you can ask for a simple meal or a quick snack. For the big breakfast fanatics, it is also possible to have a full english breakfast without actually going to the UK. 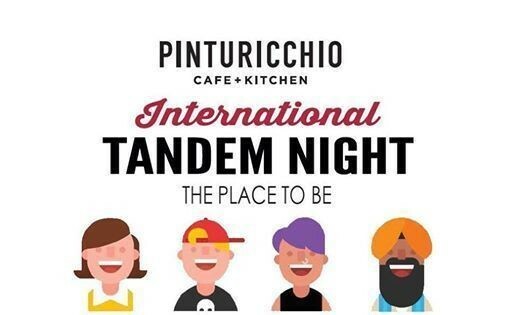 Another beautiful aspect of Pinturicchio cafe+kitchen is that it offers Tandem nights where a variety of people gather all in the same place and form small groups or couples and they exchange language skills and knowledge. This event is attracting more and more people who are looking for informal ways to improve and to learn something new. 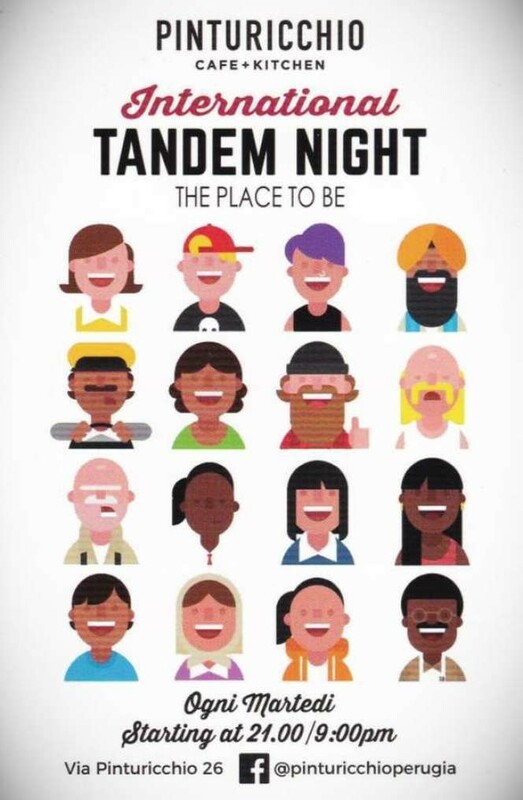 Tandem nights do not offer only a chance to get better on speaking a certain language but if you are luck enough you might end up finding an interesting person with whom you can build a relationship. I hope you get a chance to visit this corner in Perugia and possibly spend a relaxing afternoon sipping on a nice cup of cappucino. This content has been entered in the Erasmus Travellers Competition and have earned 465 points. Rate and comment about this place! 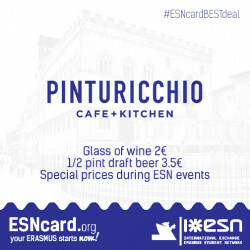 Do you know Pinturicchio Cafe+Kitchen? Share your opinion about this place.